HUH? MORE OIL MEANS LEANER? Dear most respectful ambassador to the moto brain. I just bought a relatively pristine 2015 KTM 300 XCW from a dealer. As I left the service dept after prep, the service manager told me that it had gas with an oil ratio of 32:1. He said to switch to 60:1. Thing is, it runs pretty good with the 32:1, and knowing enough to know that 60:1 will make it run quite a bit richer (less oil = more gas to the same amount of incoming air = richer) and the fact we are going into summer, would you do this? From Loving my 300 in Idaho! You know, you have to be one of the elite amongst our bevy of readers. Not only have you realized my superior intellectual power from the start, but also you have basically answered your own question. I will however, elaborate for the others. 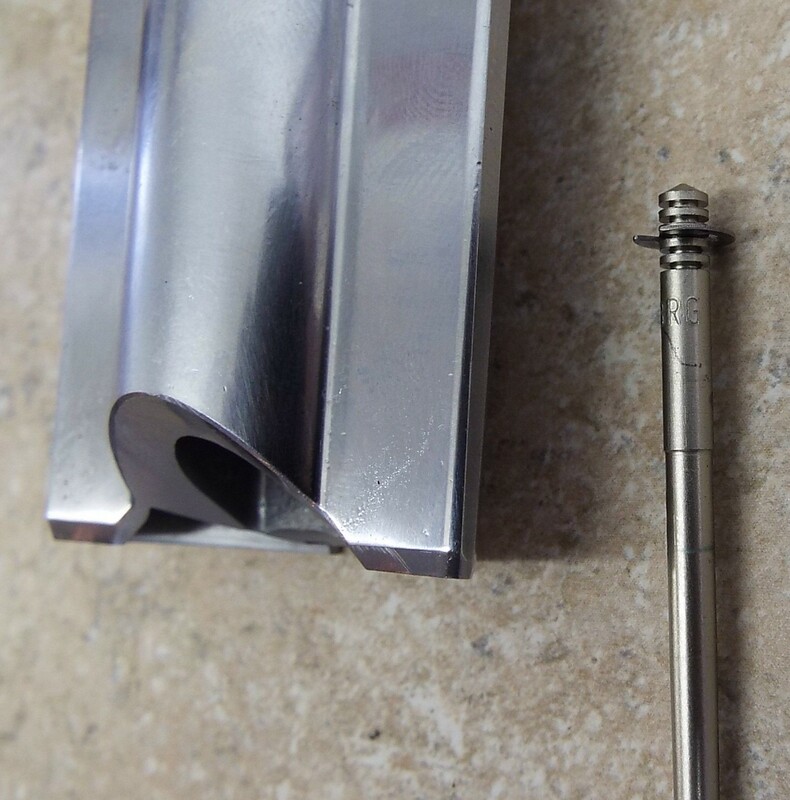 In the world of two stroke jetting, other than the actual brass jets themselves, there are three other factors, outside of deteriorating engine condition, that contribute to the overall jetting of the bike. And by jetting, we mean if the bike is running rich or lean. The three factors are air temperature; elevation and the ratio of fuel to oil you choose to run. You can’t control the air temp or elevation, but you can control the fuel – oil ratio and the jet size. Before we start with the others, let’s clear up, once again that higher elevation equals less air and therefore the bike runs richer. Higher temps also mean less air (thinner), so again it runs richer. In a two-stroke engine, there is actually primary and secondary compression. In the world of jetting, I consider the fuel – oil ratio the primary jetting and the jets secondary. This is because the fuel – oil ratio fed to the carb, not only affects all jetting ranges, but also determines it first, before it gets to the jets. 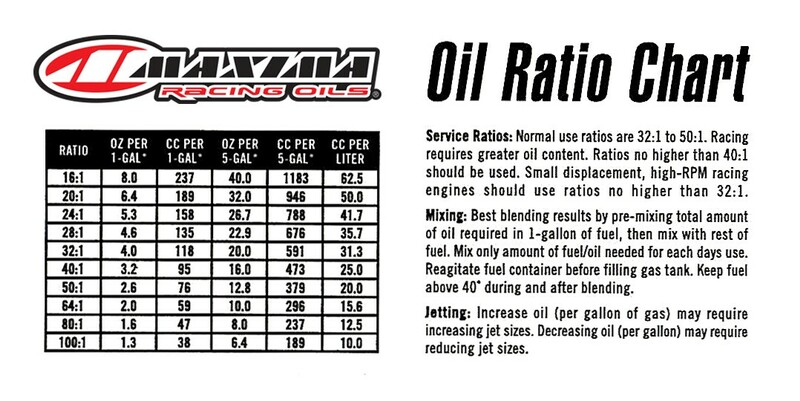 A ratio of 20:1, which is 6 oz of oil in a gallon of gas, will make the bike run noticeably leaner than a ratio of 40:1, which is 4 oz of oil to a gallon. 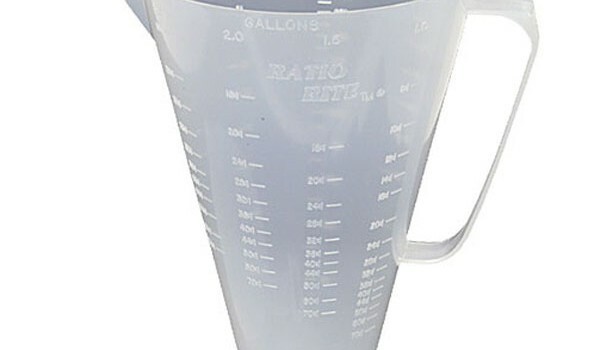 Personally, and I think other really intelligent people agree that it makes sense to mix a gallon of gas at say 20:1, 32:1 and 40:1 and test it and see which blend makes you bike run better. It’s an easy way to validate which way targets your style of riding and allows for easy changes when you head up to higher elevation and don’t want to rejet. One thing to bring up is that at higher elevations and temps that summer seems to bring, you may not be able to get a small enough pilot jet in the 300 to run well at 60:1, since the pilot jets are close to the end of the available range. Next, it’s jet time. 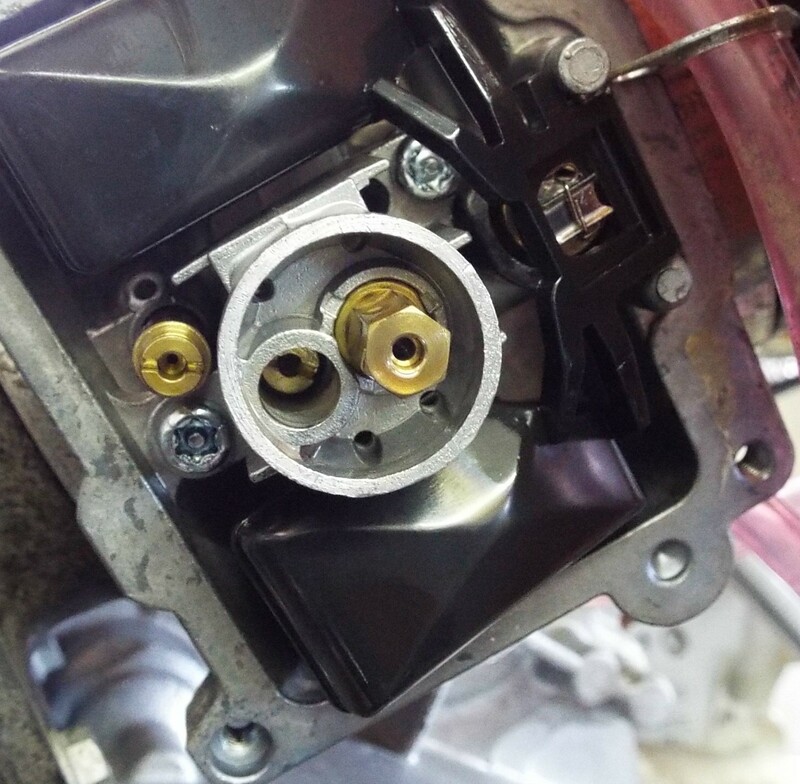 Most people know, that you can remove the top cap with the slide and be able to turn the carb enough to get to the jets without taking the carb off. The hexagonal one on the right is the main jet, which controls fuel at mainly mid-wide open throttle. The middle one is the jet pilot, which controls fuel at the low throttle openings, and the one on the left is a special jet for fuel control at the starting of the bike. It’s new over the years and is one of the reasons KTM’s start easily. It shouldn’t need to be changed. Next you have the slide and needle, with the clip in the set of grooves. Moving the clip up or down is the most common change people make, making the bike run richer or leaner from about 1/4 throttle to 3/4 throttle. Moving the clip up makes the bike leaner and down makes it richer. 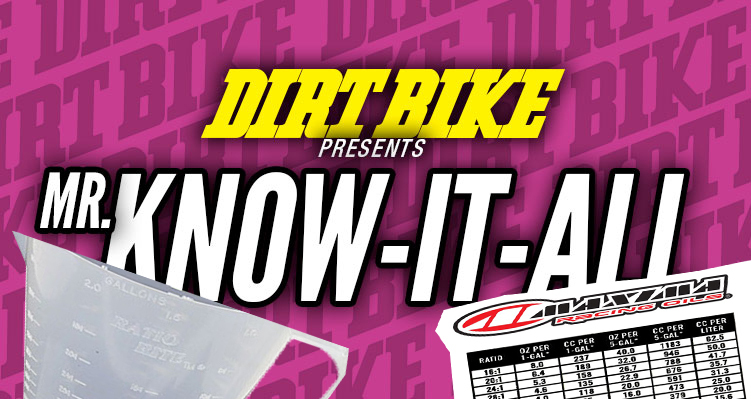 And lastly, don’t forget that 2 strokes have an air adjustment screw, found on the airbox side of the slide. Turning it out makes the bike leaner just off idle and in makes it richer. It’s an easy way to dial in response at really low throttle openings. And that’s it. You were on the right track with your thinking. If changing the amount of oil makes you bike run better, then you can get in there and change the jets, to get the bike perfect with the air-fuel ratio you may want to run.